You've found the “U.S. 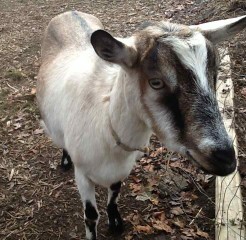 Alpine Goat Breeders” page here at Hobby Farm Wisdom! If this is the first time you have visited our site: Welcome! Alpine goats are a breed of goats originating in the Alps that are also known as French-Alpine goats. They have been bred for size and production instead of color preferences; therefore no specific color has been established. Alpine goats range from entirely white to shades of gray, brown, black, red, and other varieties. The males have very prominent beards and both sexes have medium sized, erect ears. Female Alpines are known for their excellent, heavy milk production, which can be used to make butter, cheese, soap and any other dairy product typically made from cow’s milk. Alpine goats produce milk with the lowest fat content of any milk and are on par with cow’s milk in terms of protein.